Camp Frank D. Merrill is located in Dahlonega, Georgia near the Appalachian Trail. 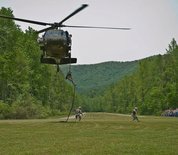 It is the location of the Mountain Phase of the Army Ranger School and the 5th Ranger Training Battalion. Here, soldiers practice mountaineering skills, small unit tactics, infiltration and extractions, raids and ambushes. This Camp Merrill directory features the critical info you’ll need to navigate through the many facilities and recreational opportunities available on base.